Austria's president has approved a coalition government between the conservative People's Party and the far-right Freedom Party. The deal will make Austria the only Western European state with a governing far-right party, which is opposed to migration and the European Union. The parties previously governed the country together between 2000 and 2005. But at just 31, the People's Party's Sebastian Kurz is set to become the world's youngest head of government. No details have been given about the government's programme, but several important ministerial roles are expected to be handed to the smaller Freedom Party as part of the deal. What propels young leaders to power? President Alexander Van der Bellen gave the green light to the deal on Saturday morning. He said the new government had assured him of both a pro-EU stance and a continued commitment to the European convention on human rights. The election on 15 October failed to yield a conclusive result. The campaign was dominated by Europe's migration crisis, something the anti-immigration Freedom Party has long campaigned about. 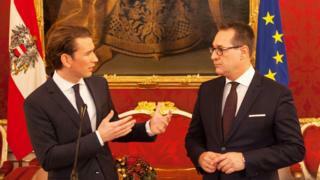 Image caption On the campaign trail, Freedom Party leader Heinz-Christian Strache labelled Sebastian Kurz an "imposter"
Mr Kurz appealed to conservative and right-wing voters with pledges to shut down migrant routes to Europe, cap benefit payments to refugees, and bar immigrants from receiving benefits until they have lived in Austria for five years. But he has promised to form a pro-EU government, despite his coalition partner's traditional Euroscepticism. Unlike most of Europe's populist parties, the Freedom Party has managed to translate its success at the ballot box into real political power. It has been a major player in Austrian politics for decades. In recent years, the party has toned down some of its more extreme rhetoric. But many analysts believe that, in or out of government, it has helped set a right-wing agenda, not just in Austria - but in other countries across Europe as well. Its stance against immigration is becoming more mainstream, along with its populist tone. The Freedom Party accused Mr Kurz of stealing their policies. Their candidate, Heinz-Christian Strache, branded him an "imposter". When the far-right Freedom Party last entered a coalition in Austria in 2000, its fellow EU member states froze bilateral diplomatic relations in response. Those diplomatic sanctions were lifted months later, after the move failed to force the Freedom Party out of government and amid fears that continued sanctions could further increase nationalist tensions. That is unlikely to happen again, as resurgent right-wing populist groups have been promoting anti-immigration and Eurosceptic agendas across much of the EU. But unlike the Freedom Party, they have struggled to convert electoral success into real power. Earlier this year, Marine Le Pen's far-right National Front party lost the French presidential election comprehensively. Ms Le Pen was defeated by Emmanuel Macron, a liberal centrist and strong supporter of the European Union. Elsewhere, the Dutch anti-immigration Freedom Party of Geert Wilders was defeated by liberal leader Mark Rutte. In Germany, the nationalist and populist right of Alternative for Germany (AfD) gained seats in the national parliament, where it is now third biggest party, but it is not in the frame for coalition talks.